Our Blue Walk and ArtWalk vacations begin in Milan, Italy. You will find this the most convenient city to fly into and out of for these programs. The Milan hotels we use for our small group walking tours and art workshop vacations are always conveniently located near Milano Centrale train and metro stations. This provides easy access to all of Milan’s sites. Also, when we depart for Rapallo by train, the station is a short walk across the street. 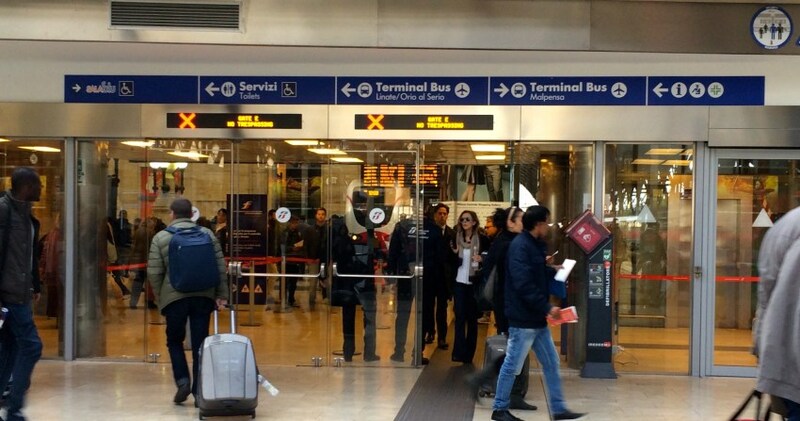 Most importantly, it makes getting to Milan center from your arrival airport very easy. Most of the major airports in Italy, and specifically the Milan Airports we mention below, require transferring to the city centers’ train stations. You may do this by airport shuttle, train, or taxi/private car. When getting to Milan we find the airport shuttle to be the most convenient as well as affordable. By following signage, and perhaps occasionally asking for directions, the airports are quite navigable. Our hotel is a short 5 minute walk from the Milan Centrale bus stop. Most will arrive from the US to Milan’s Malpensa Airport (MPX). There are stands in the baggage claim area to buy a ticket for the Malpensa Express Shuttle. In our experience the staﬀ at the desk have always been helpful and speak at least enough English to get you to the bus easily. Follow the signage to the buses, directly outside the baggage claim area. The bus will take you directly from the airport to Milano Centrale Train Station. It costs about 13 euro, runs every 30 minutes, and takes just under an hour. The bus is comfortable and convenient. A taxi from MPX to Milano Centrale may cost between $95-$120 US dollars depending upon traffic. From the Linate Airport, you can take the Linate Shuttle to the Milano Centrale Train Station. It costs about 5 euros, runs every 30 minutes, and takes about 25 minutes. Drop oﬀ will be just across the piazza from the NYX Milan hotel. A taxi from Linate to Milano Centrale will cost between $35-$50 US dollars.